"Security" isn't usually linked with "fun," but a Finnish security firm is taking a stab at connecting the two with its new application. F-Secure's ShareSafe app runs inside Facebook and flags links to dangerous websites before you post them to your friends' walls (or your own). "Security applications and Facebook tend to mix together like oil and water," Sean Sullivan writes in an F-Secure blog post. "Folks generally want to share when they're online--and not to worry about security." For this reason, ShareSafe's development team has designed the app to be entertaining, with security benefits "tagging along for the ride," Sullivan adds. Indeed, the security feature of the app does take up very little of the offering's screen real estate. It's just a form field that occupies the top of the app's home screen. You can paste a link in the form and ShareSafe will tell you if there is any unsafe content at the other end of the web address. This can be especially useful if you're dealing with shortened URLs, since their destinations usually can't be guessed just by looking at the characters in the address. The rest of ShareSafe's interface page is made up of a dashboard and a feed of top links. From the dashboard, you can keep tabs on badges and rewards you've earned (you get a "Rookie Cookie" badge just for activating the app), as well as notifications. The app awards reward points for sharing safe links, for clicks and "likes" generated by those links, and, of course, for the number of friends you get to join the ShareSafe community. Points are also awarded for other behaviors, but the exact details are secret to "keep things interesting," F-Secure explains. Points can then be redeemed for products. Right now, prizes are limited to security software made by F-Secure, but perhaps we'll see a wider selection in the future. From the links feed, you can see top links for all of Facebook. You can also choose a category and see the top links for that category--such as pictures, news, or health. A "top link" is determined by the number of Facebook "likes" it has received. 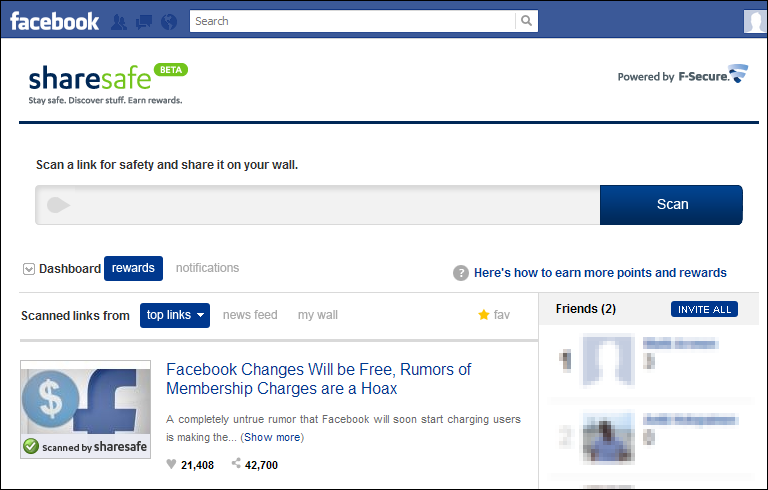 Why would you want to view your news feed and wall items through ShareSafe? Because before ShareSafe displays any items with links, it checks the links for malicious content. This way, you can make sure neither you nor any of your friends are circulating URLs to poisoned sites. According to security experts, poisoned links on social networks are a big problem. In an experiment by Dasient Security, researchers set up accounts on 11 social networks and found that not one of those networks stopped them from posting malware links. In addition, nine of the 11 links failed to block links listed in a Google compilation of poisoned websites. "The social networks we tested have some work to do on their malware countermeasures," says Neil Daswani, Dasient CTO. According to Carole Theriault, a senior consultant at security firm Sophos, "Facebook is a very enticing playground for bad guys. It is no surprise that surveys have shown an increase in malware activity on the site."